On a suggestion from Anna Alekseeva, I tackled the 14th stellation next (again by Wenninger's count). 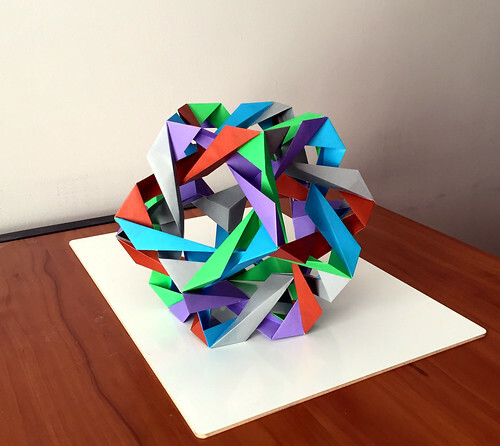 This shape is a bit different than the last 3 in that the central icosahedron is missing. The way I chose to represent this shape resulted in gap stripes along the outer surfaces in kind of a spiral-like pattern. The inner surfaces however are solid. Scale-wise, this model is the largest of the set. Folding from 6" kami resulted in a model 9" in diameter. I'm already out of display shelf-space as it is!